Teeth harbor complex root canal systems that commonly communicate with the attachment apparatus furcally, laterally, and often terminate apically into multiple portals of exit. It is critical to respect the mechanical objectives for preparing canals. Shaping canals encourages the exchange of irrigant into all aspects of the root canal system, including dentinal tubules, lateral canals, fins, webs, and anastomoses. 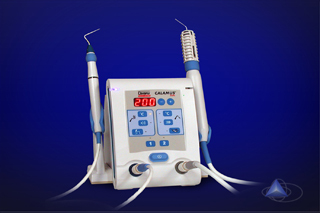 Shaping facilitates cleaning and disinfection, and promotes filling root canal systems in three dimensions. The Calamus Dual obturation system combines a Calamus Pack handpiece for downpacking with the Calamus Flow handpiece for backpacking. The Calamus Pack handpiece provides a heat source that, in conjunction with an appropriately selected Electric Heat Plugger (EHP), is utilized to thermosoften and condense gutta percha. The Calamus Flow handpiece is utilized in conjunction with an appropriately selected gutta percha cartridge and canula to dispense thermosoftened gutta percha.